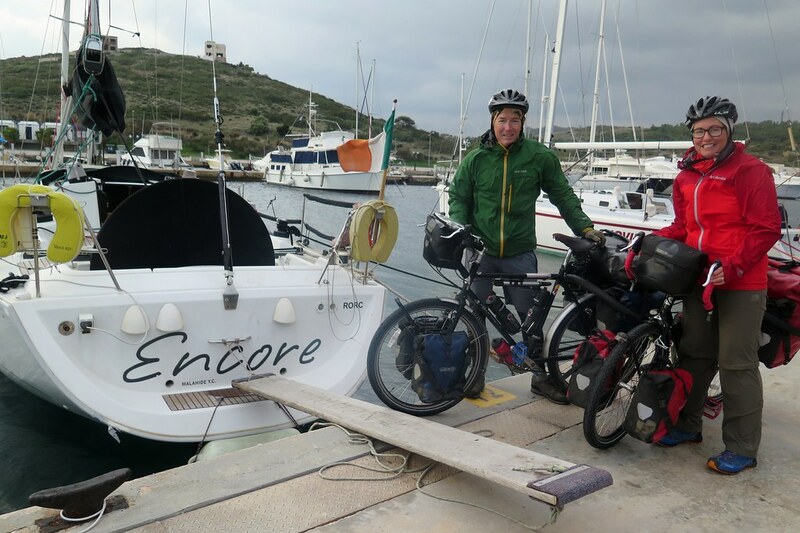 We continued up the coast road, retracing our steps as far as Piraeus, the busy port of Athens. Initially it was a pleasant day, with some sunshine, but still the ever present headwind. It’s a popular road with cyclists, we were passed by lots of lycra clad roadies, most (not all!) waved. 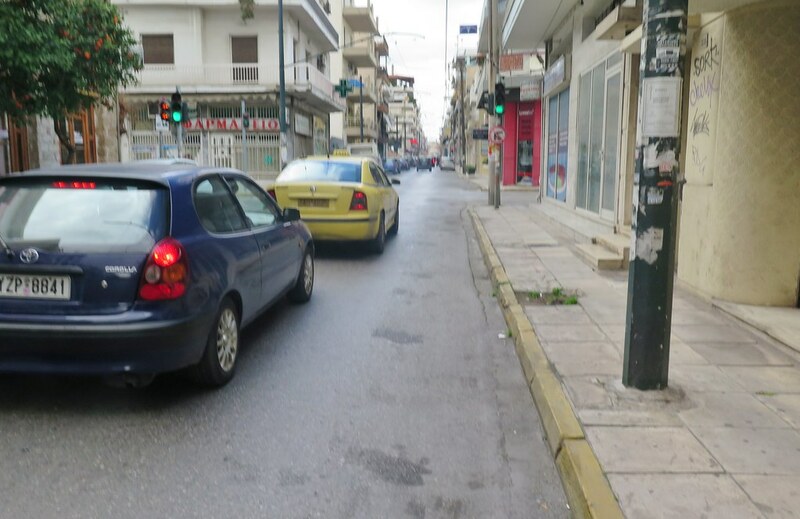 Once we got into the centre of Piraeus we were locked into a confusing one-way system and making very slow progress. 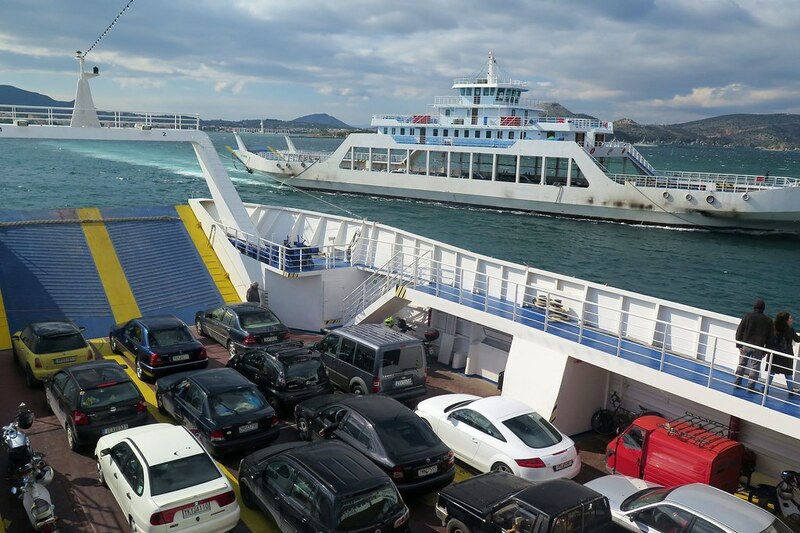 It took a couple of hours until we got out the other side, arriving at a ferry dock where we could take the small car ferry over to Salamina Island. 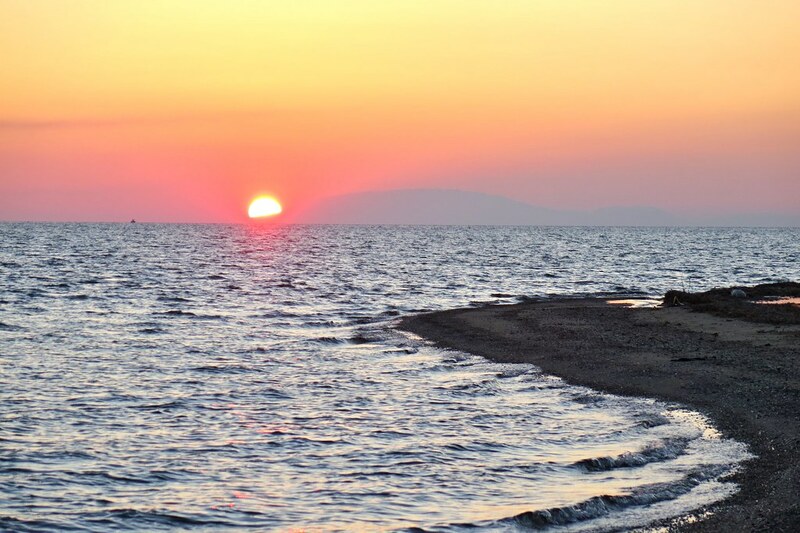 Only 10 minutes on the boat, but a world away from the urban sprawl of Athens. 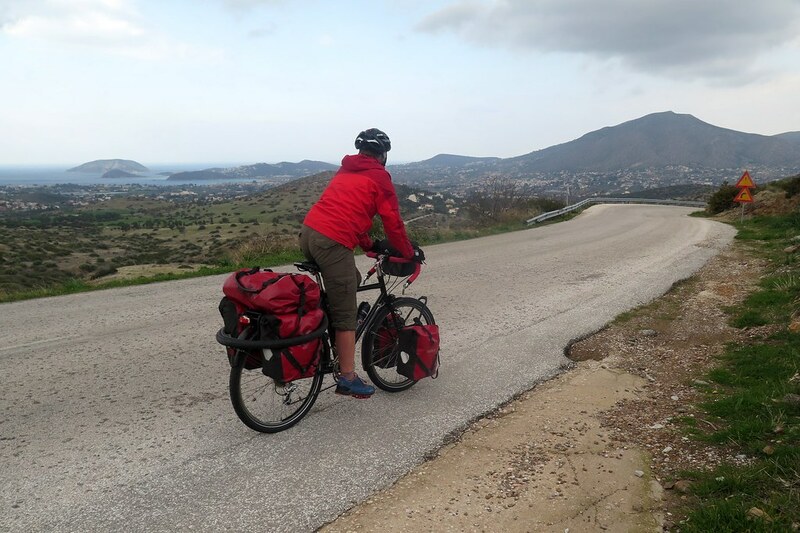 We cycled up and over the centre of the island, a gentle climb through the hills then down into the pine forests on the north coast. We saw some tracks going up into the woods and what looked like a disused holiday camp so we took the bikes up to investigate. Away from the road, the trees completely blocked out the wind and the ground was soft with pine needles so we decided to stop there for the day. 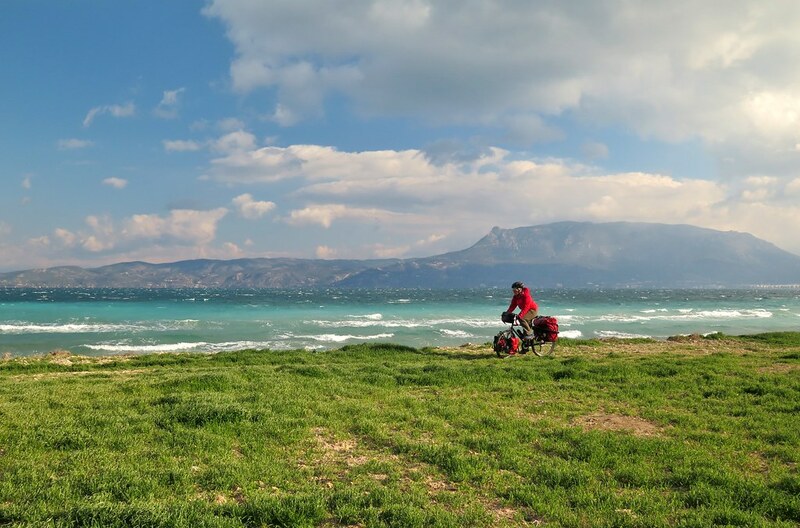 The following morning we cycled the remaining few kilometres to the western tip of the Salamina (it’s a very small island!) and took the short ferry back to the mainland. 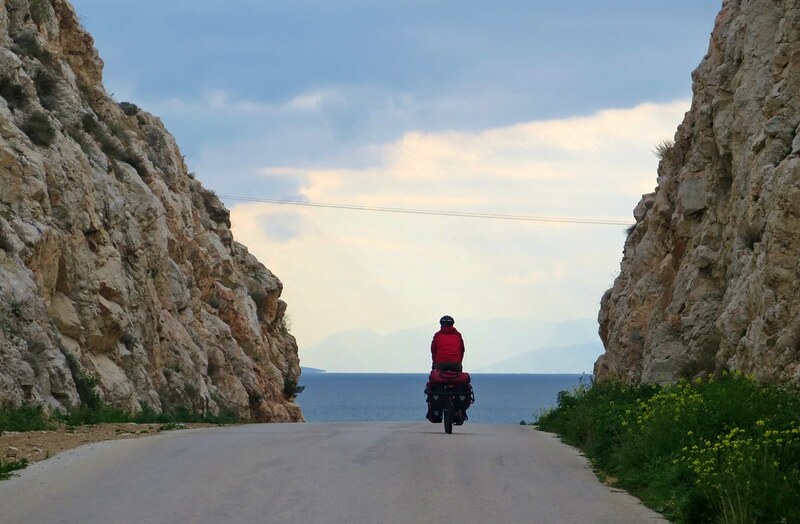 It had been a nice haven from the busy roads leading to and from Athens and a good way to cut a corner instead of riding all the way around a large bay. We continued west, with the sea on our left. 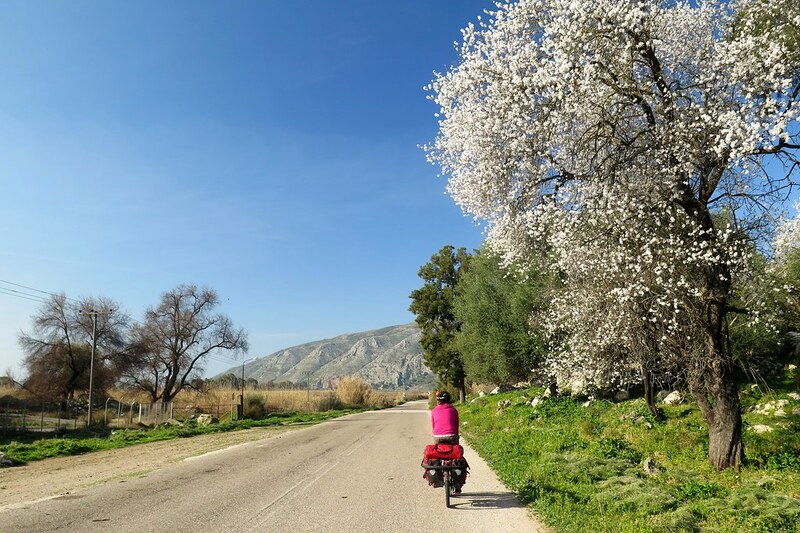 Most of the heavy traffic took the motorway towards Corinth and we were able to find quieter roads for most of the day. 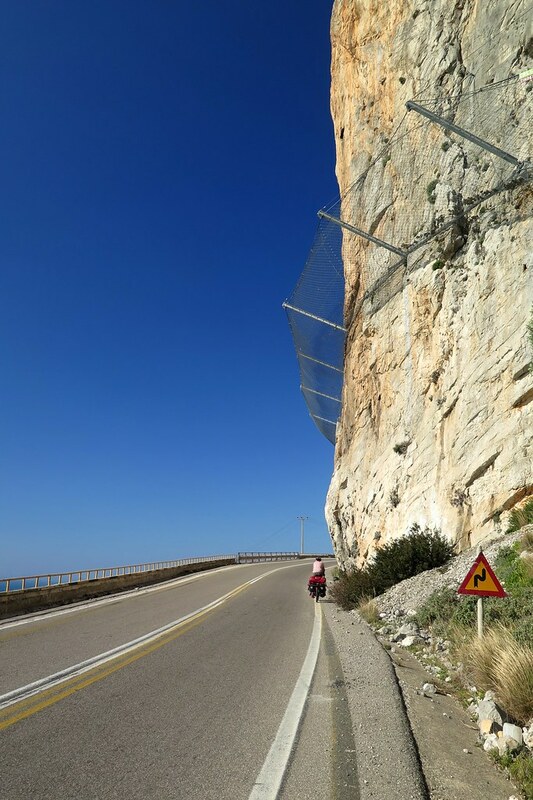 The cliffs on our right rose high above us and the road climbed up and dipped back to the sea to pass through small towns full of shuttered holiday homes. 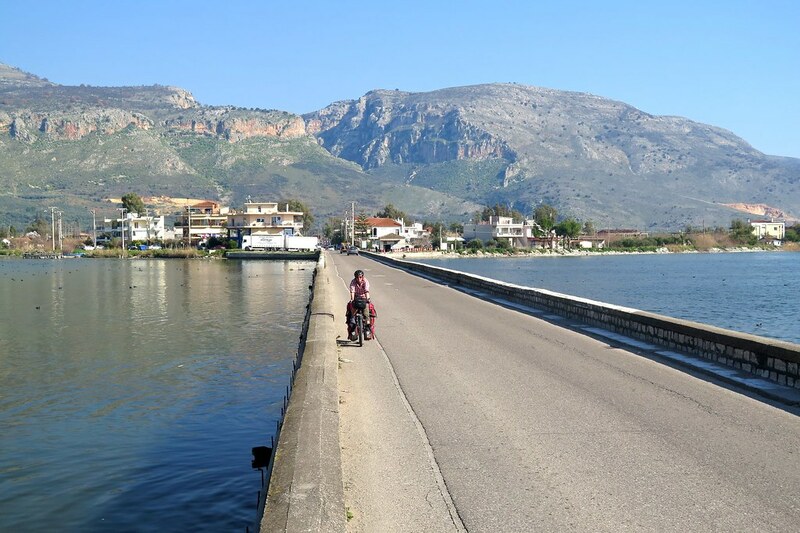 Later in the day the bay narrowed and the road started climbing towards the Corinth Canal. 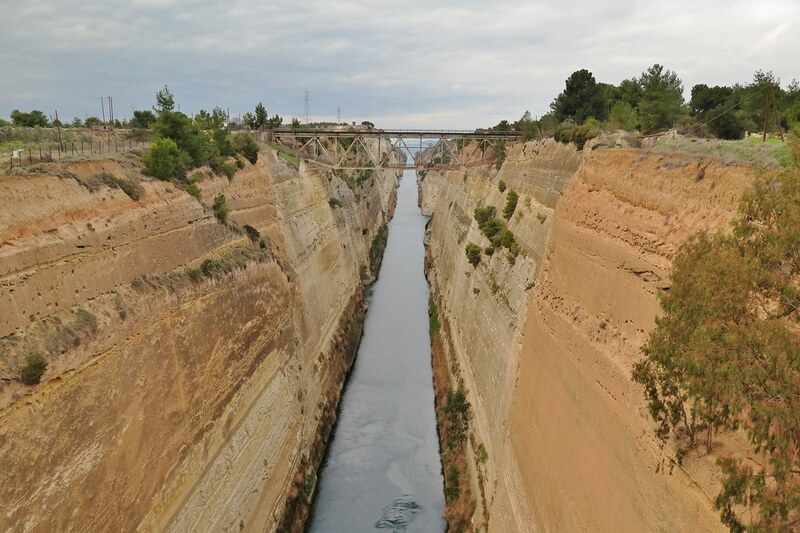 Before we knew it, we turned to cross a short bridge and the deep gorge of the canal opened up below us. 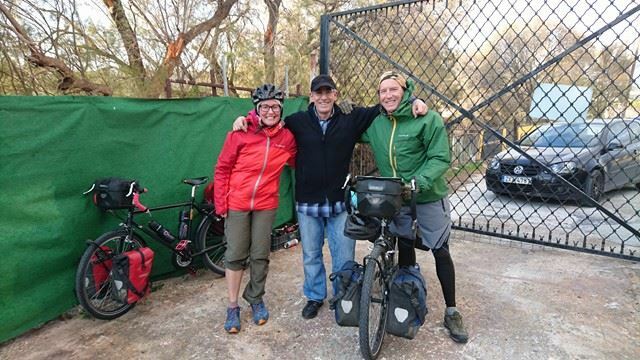 We stopped on the bridge for photos, being very careful not to let anything blow out from our handlebar bags in the wind. We’d hoped to see a ship passing through, though it wasn’t to be, but the whole thing was an incredible sight and quite a feat of engineering. 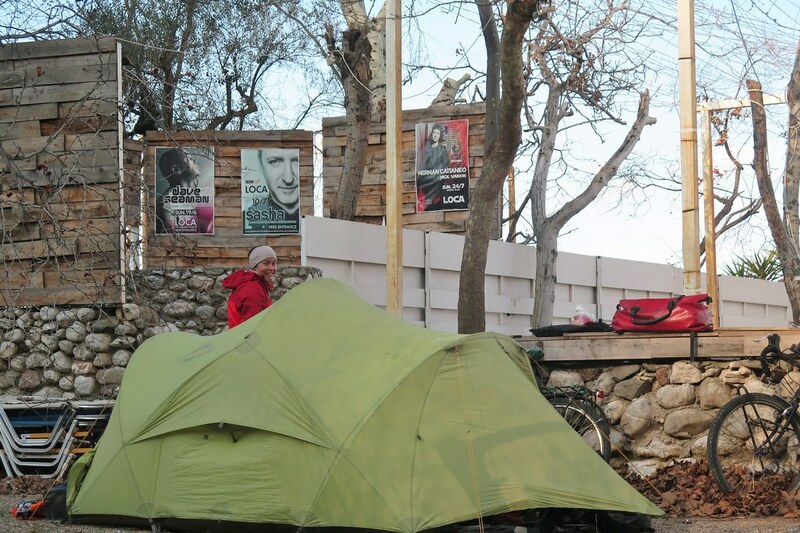 A short distance after crossing and passing through Corinth town we found a place to pitch the tent, slightly sheltered from the winds by a concrete wall and a big area of bamboo. The gusts came from all directions though, so it wasn’t the most peaceful night. The wind was behind us in the morning, and the sky started to clear. The choppy waves breaking on the shore on our right churned up the water making it a bright powdery blue which really stood out. It was a nice day’s cycling, riding through small fishing and tourist towns, we’re definitely feeling like we’re on the European mainland now. In the sun it was feeling very warm and we were able to sit out and enjoy it for our tea and lunch breaks. 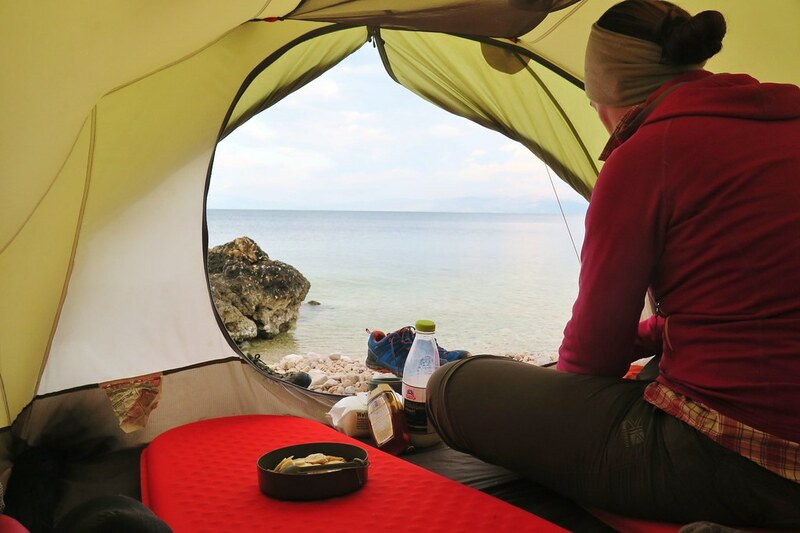 Once we reached the town of Diakofto, the road went inland for a stretch, so we decided to stop for the day and look for somewhere to camp next to the beach. We took a small track off the road and ended up by the sea, at the closed gates of a beach club. We lowered the bikes onto the sand to push them along and into the open bar area where we found a good area to put the tent up away from the wind. The walls were postered with big name DJs straight out of Ministry of Sound Annuals of the early 2000s – turns out this place, Club Loca, is quite the party spot in the summer. We awoke the next morning to silence. No waves on the beach, no wind gusting, just a warm glow from outside the tent. It was a beautiful morning, crystal blue skies and views over the bay to snowy mountains on the far side. As if we’d slept through the remains of the winter and woke up in the spring. 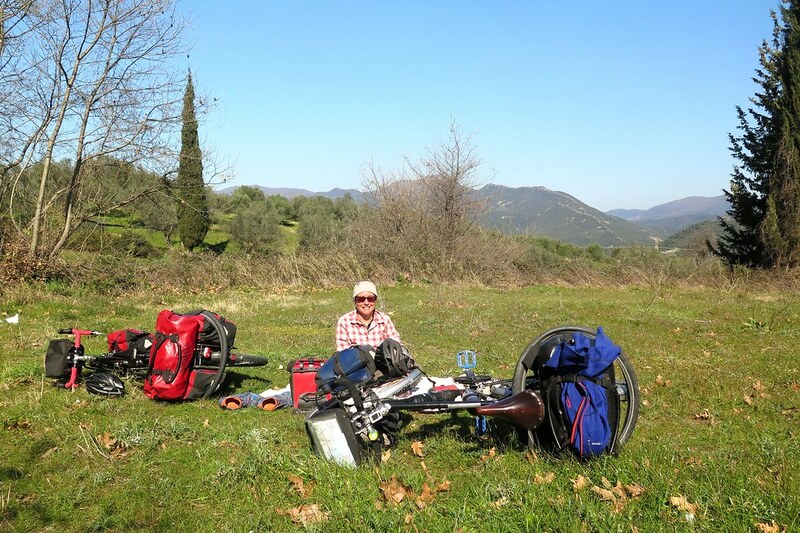 We hung around for a while to enjoy it, sitting out eating breakfast and having a second coffee before setting off. 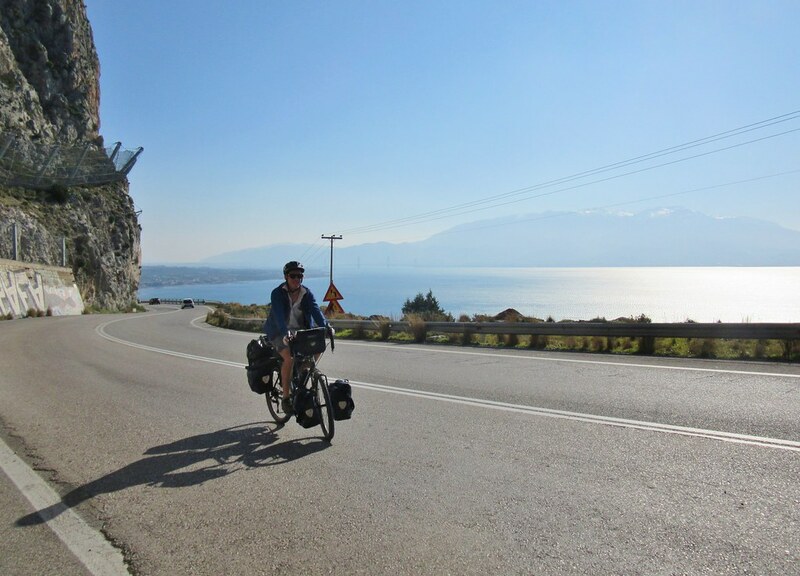 The riding itself wasn’t the most interesting as we cut inland, through long stretches of roadworks. But it was warm, and clear so spirits were high. Ahead we could see the impressive multi-stage suspension bridge connecting the north and south shores of the bay at Patra, our target for the day. Luckily, we didn’t need to join the busy traffic on the motorway to cross the bridge, there was another car ferry that took us across (seemingly for free, there was nowhere to pay?) We stopped at a cafe on the north shore, at Antirio, to check wifi and get some info on the route ahead. 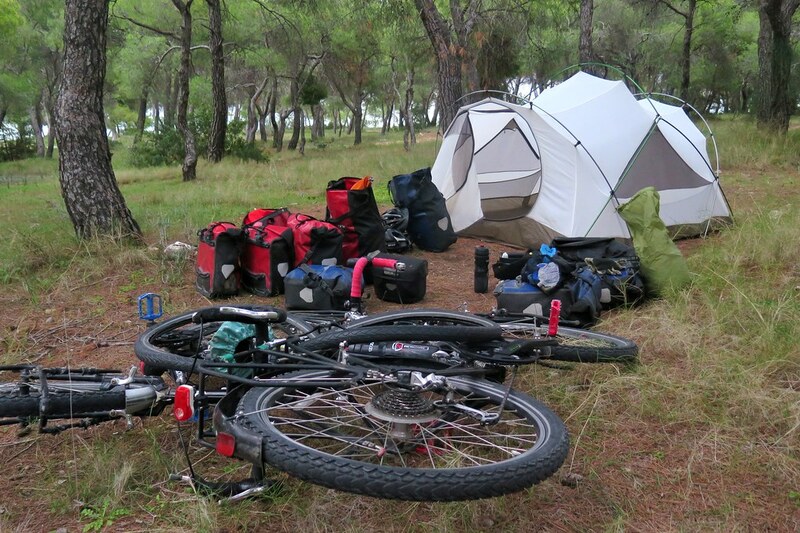 Then we cycled a few hundred metres out of the small town to pitch our tent on a quiet beach. The coastline turned a corner here, so we were facing west and had the sunset to prove it. The good weather continued as we rode north for the next couple of days. At first we were right on the coast, hugging the cliffs and climbing, enjoying the views and the sunshine. It felt great to be warm again and covering distance on the map after a month of hanging around waiting out the winter. 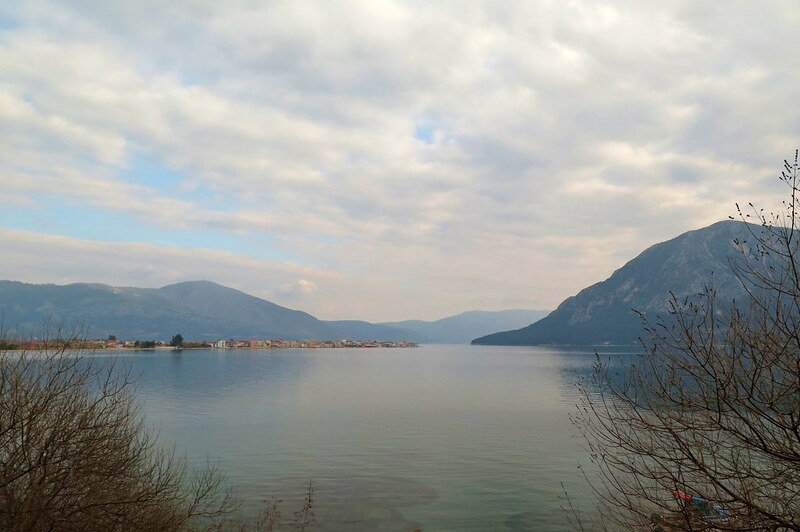 We cut across inland towards the town of Mesolongi, which took us through some coastal hills before a long downhill back to sea level and into a national park area made up of salt lakes and wetlands. We crossed a long low bridge over a lagoon, stopping on an island in the middle, then found a place to camp in a picnic area in the woods. Complete with benches, bins and a water tap, but unfortunately right next to a farm, which was pretty loud with all kinds of animal noises through the night. The next day we left the flat wetland area and climbed again over the cliffs, taking us up and down through a succession of beautiful coastal towns. Around us the trees were starting to blossom, evoking memories of sakura season in Japan. This area was incredibly quiet, the towns were sleepy and the roads were almost completely empty. 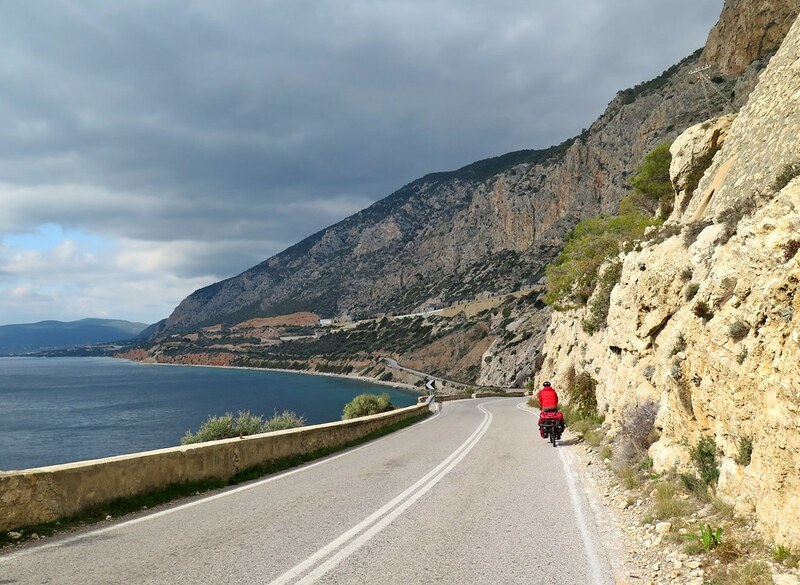 For most of the day it was just the two of us riding side by side following the Ionian coast, with sheep and goats the only other living things around. Perfect cycling. 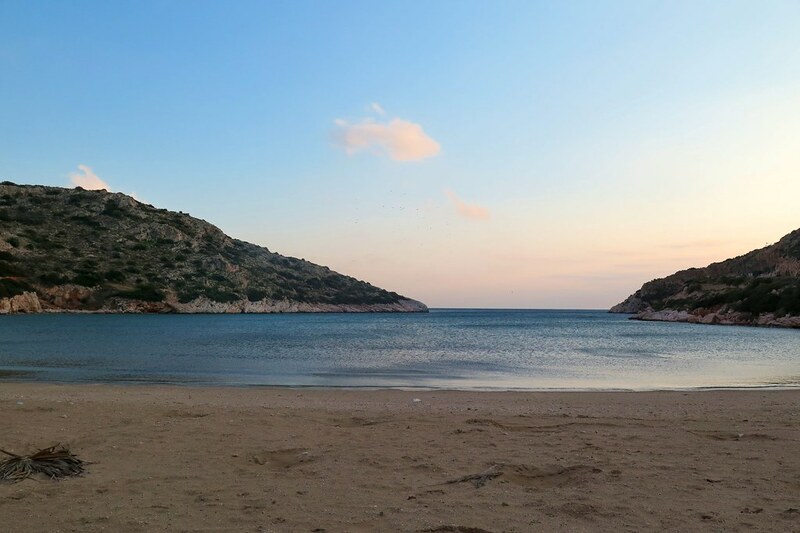 After passing Astakos and Mytikas we stopped for the day on a little stony beach. 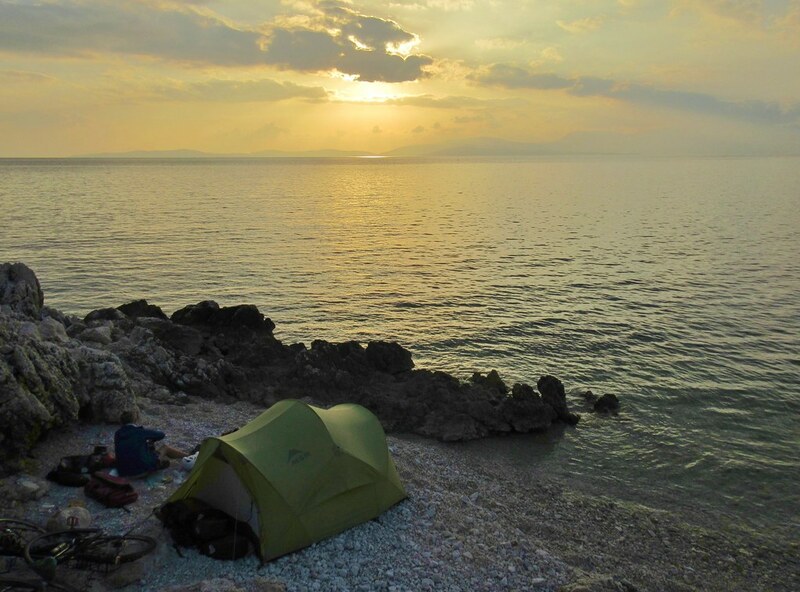 We kicked out a flat area, smoothing the pebbles into a platform for the tent just a couple of feet from the water’s edge. 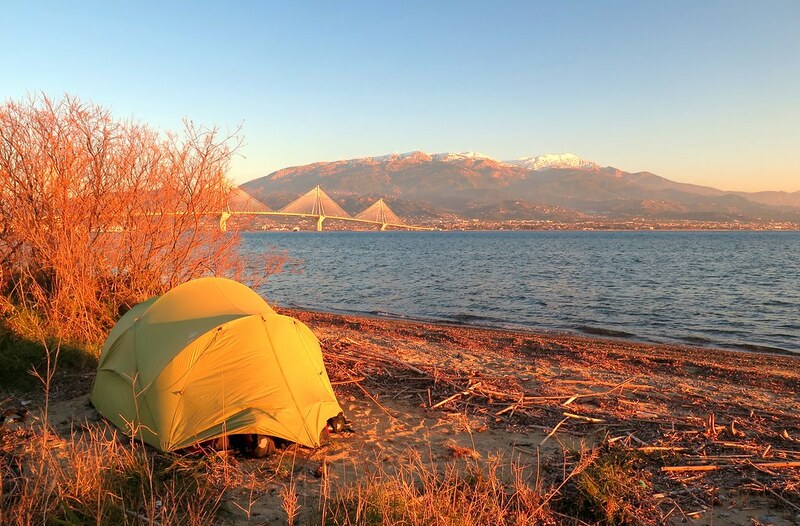 It had been seven consecutive nights camping, a rarity for us, and in the morning the sky was cloudy. The weather forecast was for rain so we felt we’d earnt a rest day and a roof over our heads. 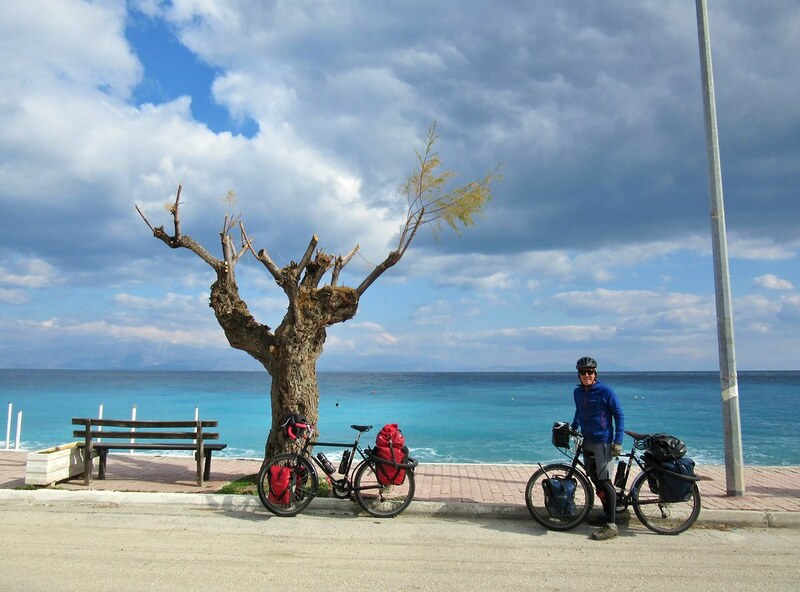 A short distance up the coast was Paleros where we found a hotel to hide out, and to wash ourselves and our clothes. Skyping with our respective families, it turned out that we were right next door to a resort where my parents had been on holiday, and Clare’s brother-in-law had worked for a couple of summers. Quite a coincidence, we’d just picked the hotel as it was cheap and close to where we were! The good weather looks like it’ll return after our rest day, and we’re spending a relaxed day here hiding out from the rain. It’s been a great week cycling, we’ve got our momentum back and we’re looking forward to more to come. Another interesting blog Andy. 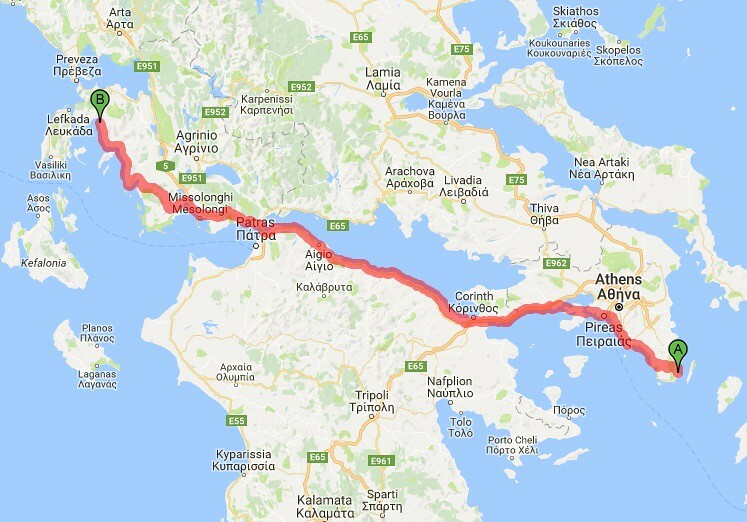 I shall look forward to seeing how you get to Preveza..under the tunnel or around the inland sea which was beautiful to sail in. Anyway enjoy your final few months and hopefully as you head north the warm weather will come with you. Under the tunnel! But in a van, as bikes weren’t allowed to cycle through.